View More In Showers, Parties & Receptions. The Best Gift a Bride Can Receive! An ideal keepsake to cherish for present and future generations! New recipes rarely compare with time-tested favorites that have been passed down for generations. These family recipes create a culinary legacy from one generation to the next. It is a "Rite of Passage" for the bride to receive these recipes, tips, and tricks. They form part of a family's history, steeped richly in culture and tradition. No one writes these better than family and special friends who are "like family." Ideal as a bridal shower or wedding gift. 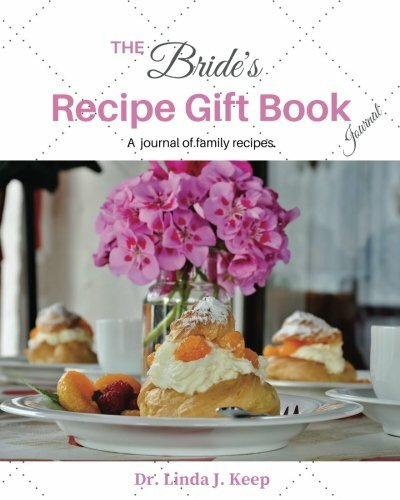 Guests can write their favorite recipes in the book at the shower, or give recipes to the bride that she can pen in later. Better yet, recipes could be added gradually as the bride visits with each loved one throughout the year. The journal has space to share favorite breakfast, lunch, dinner, dessert and other favorite recipes. There is a section for tips and tricks. Well-guarded family secrets are perfectly placed in this treasure trove to cherish always. Loved ones will enjoy sharing these treasures as much as the new bride will love receiving them! Each recipe identifies who shared the recipe, the history of the recipe and why it is a favorite. These are rare mementos perfectly recorded in a culinary legacy. There is a designated page with "to and from" fields: "To (Bride's Name)" and "From (Your Name)" with beautiful words written beneath each. Scroll up and grab a copy today! Look no further. You have found the perfect gift for the Bride! Personal Note: "My heritage is French and one recipe that has been closely guarded for generations is our beloved 'Tourtière,' the French Canadian meat pie. In my humble opinion, OUR family recipe is the most flavorful, moist and wonderful. Tourtière is traditionally served on Christmas Eve. Each Christmas season my mother and I would play Christmas tunes, don our aprons, and get baking. There is something special about these incredible recipe favorites passed down for generations. Baking Tourtière is one of many Christmas traditions that I will cherish forever."